Pioneer’s PL-41D incorporates a host of important features for professional stereo music reproduction and is eminently suitable for the highest quality home music systems. A belt-drive stereo turntable with precisely finished turntable platter and tonearm, the unit has the look of distiction – and the performance to match. Its motor is the 8-pole hysteresis synchronous type, designed for unvarying speed accuracy, regardless of voltage fluctuations, and for extremely low vibration, noise, and wow and flutter. 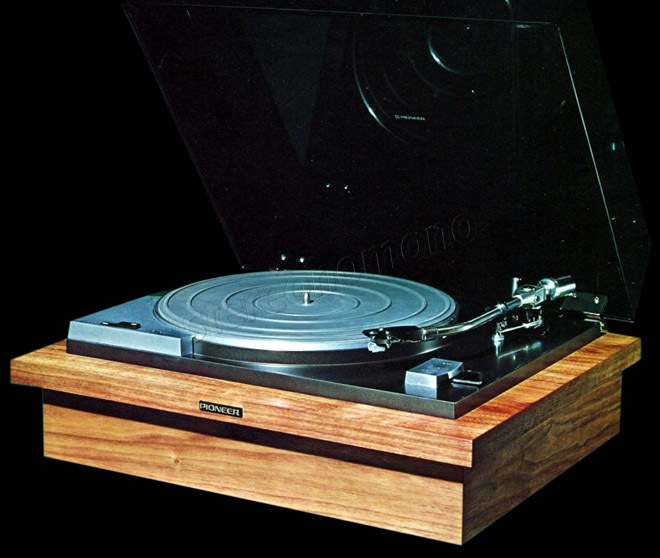 Other key features of the PL-41D include Pioneer’s unique suspension assembly, advanced polyurethane belt, polished for unerring accuracy of revolution, a heavy aluminum alloy diecast turntable platter, a lateral balancer and tonearm height adjustment device to assure perfect tracking. Not the least important feature of the PL-41D, in keeping with Pioneer’s tradition of offering maximum value for your stereo investment, is a inducted magnet type cartridge with 0,5 mil block diamond stylus, good for more than 2000 hours of fine music playback.